©Bert Gildart: The cacti are blooming now in the hills that surround us here in Arizona’s Lost Dutchman State Park, allowing me to pursue my fascination with macro photography. For me that means multiple strobe setups and a sturdy tripod to optimize composition. Ideally, the tripod should be one that allows one to position the camera about a foot above the ground level. Strobes enable one to arrest all motion and optimize depth of field. To improve understanding of the flower’s components requires that one increase depth of field, and so I stopped my Nikon 105mm macro lens down to f-32. As well I set the camera to manual and then the shutter speed to 250 of a second. Those settings override ambient light meaning that all illumination is created by the proper positioning of the strobes. Such powerful light positioned up close makes the background go black which seems to intensify the flower’s yellow color. However, the brilliance of strobe light can create “hot” spots so I covered the domes with diffusers. But the work pays off for it dramatizes the color and it accentuates the spines of the cacti, which appear as tiny spears. Touch them as you may think they are. Hard to believe that from an evolutionary point of view spines were actually derived from leaves. 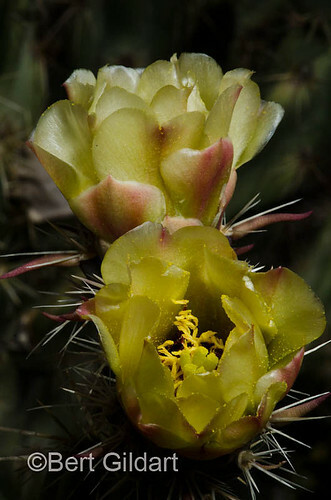 Because the thorns seem to leap onto a person’s clothing and lodge in their flesh, many call these yellow-flowered cacti “jumping cholla.” Spend a day wandering around cacti and you’ll soon agree the term is appropriate. This entry was posted on Tuesday, March 27th, 2012 at 7:01 am and is filed under National Lands, Natural History/Conservation, Photography, RV Travel. You can follow any responses to this entry through the RSS 2.0 feed. You can leave a response, or trackback from your own site.